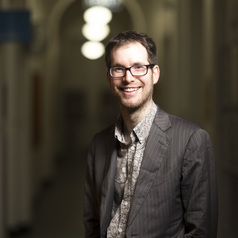 Dr Martin White completed his PhD at the University of Cambridge before spending the next few years flying between Cambridge and CERN as a member of the ATLAS experiment at the Large Hadron Collider. He is currently an ARC Research Fellow and senior lecturer at the University of Adelaide where he is busy searching for new particles in the LHC data and working with international theorists and astrophysicists on how to unravel the mystery of dark matter. He has given lectures around the world on particle physics and cosmology, including sharing a festival bill with the Pet Shop Boys and Grace Jones. He records and plays in a variety of pop bands, occasionally with a physics theme, and unwinds by watching Scandinavian comedy films.